Eimear Richardson starred with bat and ball again to set up Ireland's crushing victory over Netherlands in the finals of the women's European championships. The scoreboard was strikingly similar to Ireland's demolition of Scotland on Monday - Richardson again picking a bagful of wickets, the opposition folding for a double-digit total, and Ireland's openers sprinting to the target with more than 35 overs to spare. Unlike Scotland though, Netherlands made a solid start after winning the toss. 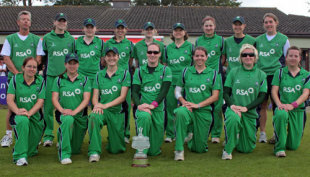 Their openers added 35, a stand dominated by Violet Wattenberg, before a run-out gave Ireland their first breakthrough. It was a procession after that, with Richardson and legspinner Ciara Metcalfe running through the Netherlands batting. Wattenberg (34) was the only batsman who made more than 7 - extras was the next highest contributor with 10. Metcalfe had Wattenberg bowled when the score was 45 for 2, and a spectacular collapse followed leaving Ireland a target of 69. Ireland's openers, Richardson and Cecelia Joyce, had little trouble knocking off the runs, scoring at more than a five an over. Richardson favoured the zone between covers and point, hitting three fours on her way to 28, while Joyce picked off several of her five boundaries through square leg and midwicket as she raced to 35.